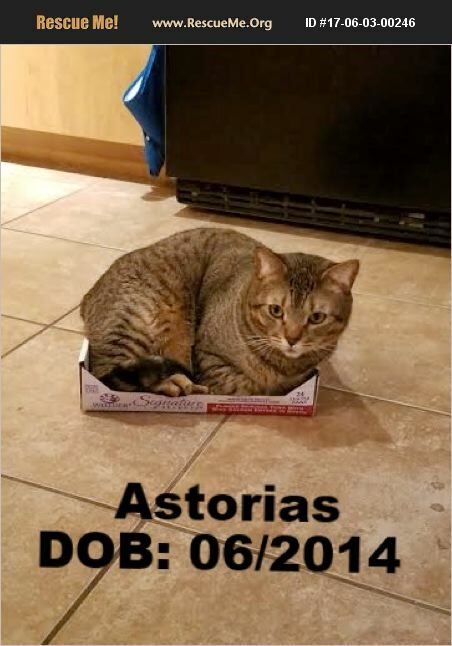 COURTESY POST: Artorias (aka Fat Boy) is a 3 year old male domestic short haired cat. He earned his nickname because even though he is a touch overweight, he would still be a large cat (the vet expects his ideal weight to be around 12lbs). He is an extremely loving and cuddly cat. Taught from a young age that humans are wonderful, he loves to receive belly rubs (with no fear on the human's part of being scratched!) and being cradled like a baby. He has only had one set of owners since he was adopted as a kitten, and is an overall lovebug. He will lay on your lap when watching TV, sleep with you at night, and in general enjoy your presence and companionship. He does well with other cats and dogs, and has lived with them for extended periods of time only taking about a week to warm up to them. He has a little bit of a quirky personality, such as after a human takes a shower, he loves to sit in the wet tub and lick the walls. When the right blanket is given to him he will knead and suckle on it - this is something he's done since he was a kitten. He is being rehomed due to his chronic medical condition. He was diagnosed in November 2016 with Feline Idiopathic Cystis (aka FIC) and now requires an environment that is as low stress as possible, and where he can receive ample attention. The way FIC works is there is an inflammation of either his urethra, or his bladder (due to an unknown cause) and he will go into 'episodes' that can last up to a week. Commonly this is misdiagnosed as a bladder infection, urinary tract infection, or stones. An unfortunate side effect of this condition is during an episode he has a tendency to urinate outside the litterbox. This is due to him urinating when and where he can in order to alleviate the pain that comes with it. With his condition his current home has found that by giving him ample water, and feeding him a prescription wet food they can curb the severity of his episodes. However if he is in an episode the most effect treatment they've seen is to administer an anti-spasmodic (or a muscle relaxant) paired with a pain medication. If in the right environment where he isn't stressed, receiving ample attention, and has a large water intake he could go months without having an episode. (**This does NOT necessarily mean that the condition has gone away**) Unfortunately his current home is no longer able to fulfill these requirements. We know it seems like a lot to take on but one look in his yellow-green eyes framed by the two dots on his nose will have hearts in your eyes. If you are interested in Artorias, please complete the Cat Interest Form on our website (www.azrain.org) and, if you are selected as a prospective adopter, we will contact you to set up a meet and greet with Artorias. Thank you for considering rescuing an animal in need! The 1st step to adopting any of our cats is to fill out an application by going to our website www.azrain.org. Go to the ADOPT Tab, then Click on CAT INTEREST FORM. Click SUBMIT, OR email it to: info@azrain.org. Some of our Felines are at: 2840 W Chandler Blvd. at PetSmart, in the Lowes shopping center. And also at the Tempe Marketplace location at 1900 E Rio Salado Pkwy Tempe, AZ 85281. FOR ALL CAT QUESTIONS: CALL 480-250-4215 OR 480-285-7322. We have applications available at 2840 W Chandler Blvd. (at PetSmart, in the Lowes shopping center). It is located at the 101 and Chandler Blvd. OR, you can go to our website and get one, then email back to us at info@azrain.org OR, hand deliver it to us on Saturdays at our Donation Table we have set up, right of the front door at PetSmart. Volunteers run the table every Saturday from 10am-2pm. They will make sure it gets to the correct department. Many Thanks! ~~~~~~ We are a 501c3 non-profit Rescue. R.A.I.N. Rescue (Rescuing Animals in Need). ** ALL OF OUR PETS ARE: microchipped, feline Leukemia tested, up to date on shots, and spayed/neutered and dogs are current on Rabies shot. CAT QUESTIONS: CALL 480-285-7322 OR EMAIL: info@azrain.org (for dogs and cats). Cat and Kitten Adoption fees: Pricing ranges from $100.00 on up. Price includes: 1st set of shots/booster, feline Leukemia test, spay/neuter, and microchipping. We try to remove each cat, kitty, dog and puppy as soon as they are adopted. However, everyone that works with R.A.I.N. Rescue are volunteers and have a regular 40 hr. work week. Sometimes it isn't done as quickly as we would like though. Our apologies in advance. CAN YOU HELP US???? R.A.I.N. Rescue is desperately seeking foster homes for SMALL dogs, puppies, cats and kittens. We currently need volunteers for these Departments: Foster Homes, Transporters, Groomer, Adoption Center, Donation Station and Fundraisers.